â€˜Ther’s tha devil movin’ in my blood’. 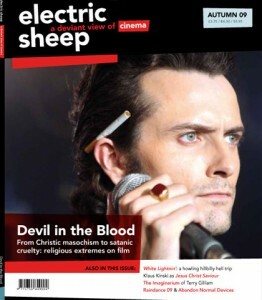 The autumn 09 print issue of Electric Sheep looks at religious extremes on film from Christic masochism to satanic cruelty. 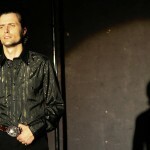 The extraordinary White Lightnin’ explores the Old Testament world of demented mountain dancer Jesco White while Klaus Kinski disastrously reinterprets the New Testament in Jesus Christ Saviour â€“ and subversives Alejandro Jodorowsky and Kenneth Anger dynamite divine myths. Plus: Terry Gilliam’s The Imaginarium of Doctor Parnassus, Raindance 09, political animation, and louche mariachi rockabilly Dan Sartain picks his top films! [The magazine contains exclusive articles and interviews not available on the website.] The new issue is available from the specialist book store CinÃ©philia, at selected retailers and cinemas or online from Wallflower Press. This month sees the release of the exceptional White Lightnin’. You can read a short review online, but the interview with director Dominic Murphy is only available in the autumn 09 issue of the print magazine. Also out at the cinema this month is another unmissable film in an entirely different genre: Big River Man is a documentary about Slovenian champion Martin Strel’s attempt to swim the Amazon. Hilarious and tragic at the same time, with definite Herzogian undertones, it is one of the most enjoyable and affecting films of the year so far. A crop of excellent festivals will be offering unique cinematic experiences throughout the month. Abandon Normal Devices is a new festival that seeks to challenge preconceptions about the moving image, taking place in Liverpool. AND will preview Pontypool, one of the smartest and wittiest zombie movies we’ve seen in a long time. Now in its 12th year, the digital festival onedotzero will also be showcasing new forms of moving images, including shorts, animation, music videos and audio-visual performances, starting in London before going on tour. And to mark the opening of the 17th Raindance Film Festival on September 30, we have a review of Kakera â€“ A Piece of Our Lives, which will be screening as part of the festival’s focus on Japanese women directors. In the DVD reviews we have wonderful, long-lost giallo Footprints, beautiful, melancholy Japanese teen-centred chiller Goth: Love of Death, little-known Charles Bronson gem Rider on the Rain, Peter Sellers’s first film outing Penny Points to Paradise and a short extract from the discussion of Jane Arden’s Separation, which appears in full in the autumn 09 issue of the magazine. Finally, we have an interview with Steven Severin and Danny Plotnick about their work in music and film, conducted at the Revelation Perth International Film Festival by our Australian correspondent, while in the Short Cuts we have a piece on a Don Hertzfeldt event organised in June by the London International Animation Festival, which is in full swing right now.